Narmadashankar Lalshankar Dave (24 August 1833 – 26 February 1886), popularly known as Narmad, was a Gujarati poet, playwright, essayist, orator, lexicographer and reformer under the British Raj. He is considered to be the founder of modern Gujarati literature. After studying in Bombay, he stopped serving as a teacher to live by writing. During his prolific career, he introduced many literary forms in Gujarati. He faced economic struggles but proved himself as a dedicated reformer, speaking loudly against religious and social orthodoxy. His essays, poems, plays and prose were published in several collections. His Mari Hakikat, the first autobiography in Gujarati,[A] was published posthumously. 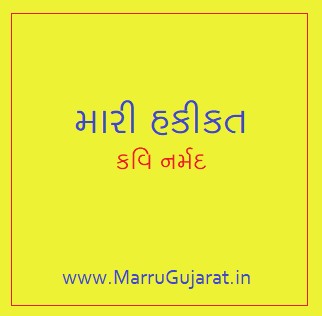 [B] His poem Jai Jai Garavi Gujarat is now de facto state anthem of Gujarat state of India. Narmad was born in Surat, Gujarat on 24 August 1833 to Lalshankar and Navdurga. His family home in Amliran, Surat was destroyed in the great fire of 25 April 1837 which was later reconstructed. He commenced schooling with Nana Mehta in Bhuleshwar, Bombay at age five. He later joined Fakir Mehta and Ichchha Mehta's school in Surat and moved to Bombay where he attended the Government Gujarati school of Balgovind Mehta at Pydhonie. He returned to Surat where he attended the school of Durgaram Mehta and Pranshankar Mehta. He was initiated in Upanayan at age eight. He started studying at the English School, Elphinstone Institute, Bombay on 6 January 1845, beginning college in June 1850. He delivered his first public speech Mandali Malvathi Thata Labh (The Advantages of Forming An Associations) that same year. His mother died on 23 November 1850 and he left college. He was appointed as a teacher at the school of Rander on 1 May 1851. He again recited his early essay in Swadesh Hitechchhu Mandali and started Gyansagar magazine in July 1851. He was transferred to a school in Nanpara in March 1853. After the death of his wife Gulab, he left this position and went to Bombay, in January 1854. He returned to college on the suggestion of his friend Jhaverilal Umiyashankar and joined Buddhivardhak Sabha, a literary group in June 1854. He started learning Siddhant Kaumudi. He became interested in poetry and started writing in September 1855, studying literary metre over the following year. He presided over Buddhivardhak Granth from March to December 1856. After his second marriage, he left college in August 1856, writing Pingal Pravesh in February 1857 and dedicating it to his father. He joined Gokuldas Tejpal Vidyalaya as a teacher and began studying Sanskrit literary works such as Laghu kaumudi, Chandralok, Nrisimhachampu, Kavyachampu, Prataprudra, Adhyatma Ramayana. He started at Central School as a teacher in February 1858, then resigned in November 1858 after deciding to pursue a literary career. He studied Sanskrit grammar and poetry in Pune from November 1858 to March 1859. Deciding to study independently he returned to Bombay in March, where he met Dalpatram, a reformist Gujarati poet, in June 1859, and became involved in reform activities. His wife Dahigauri returned to her parents' home. In 1860, he had discussed widow remarriage with religious leader Jadunathji Maharaj, which led to him becoming involved with the Maharaj Libel Case the next year. The case was filed by Jadunathji against writer Karsandas Mulji after the journalist published an article alleging sexual exploitation of women in his religious sect. He visited Income Tax Commissioner Curtis regarding a surcharge on 3 February 1863. With the help of friends, he started a biweekly newsletter called Dandiyo, modeled after British weekly The Spectator, in September 1864. It was loudly reformist in its stand and attacked traditional customs of Hindu society. It ran until 1869 when it was merged with The Sunday Review. [C] On 18 January 1864, his father died, aged 56. He moved back to Surat in July 1865 and sheltered Savitagauri, a widow, in a neighbouring house. He published Narmagadya in September 1865. He was banished from his caste due to reform activities on 18 August but reinstated on 21 November 1866. 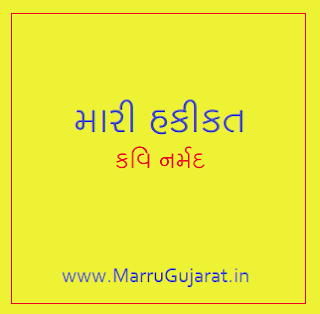 The same year, he wrote his autobiographical work, Mari Hakikat, the first autobiography in Gujarati. He published Nayikavishaypravesh and Uttam Nayika dedicated to his then separated wife, Dahigauri. In early 1867, he published Narmakavita, a poetry collection. He had debts of 10,000 that caused him great concern. He married again in 1869. He published summaries of Ramayana, Mahabharata and Iliad in 1870. He published the school version of Narmagadya in 1874 and the edition for the government in 1875. He moved back again to Bombay in March 1875, where he met Dayanand Saraswati, a reformist and founder of Arya Samaj, and started to become deeply religious. He published the first dictionary of Gujarati language in March 1876. He founded Vedsarasvati in Sarasvatimandir of Surat on 16 April 1877. Aryanitidarshak Mandali performed his play Draupadi-Darshan in 1878. By 1880 he had become fully "believer" and performed Upanayana for his son that year. He wrote a play, Shri Sarshakuntal in 1881 which was performed. He published a translation of Bhagvad Gita in 1882. Although unhappy about breaking a resolve not to work for other people, he was forced due to financial difficulties into taking a position as a secretary to Gokuldas Tejpal Dharmakhata. He wrote a play, Shri Balkrishnavijay in 1883. His health failing due to the stress of work starting a hostel, he left his job on 19 July 1885. After a prolonged eight month illness, he died of arthritis on 26 February 1886 in Bombay.